Columban Father Oliver “Oli” McCrossan served in the Philippines since shortly after his ordination in 1975. The native of County Donegal, Ireland organized and sponsored many economic and personal development programs in the Philippines, including promotion of organic, sustainable agriculture and work with people with disabilities. 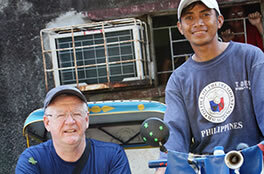 One of Father McCrossan’s most successful endeavors is the Pedaling to Live Program centered in Ozamis City on the southern Philippines island of Mindanao, which he started in 2006. Relying on donations and a people’s cooperative bank, the program assists the poor in obtaining financing and repayment plans for ownership of three-wheeled “pedicabs,” or sheltered tricycles, which they otherwise would have to rent. The new owners use these pedicabs as a taxi service, thereby earning money to support their families. Father McCrossan’s idea was a resounding success, and in December 2010 he expanded it into the Pedaling to Live Housing Program. Pedaling to Live is one of numerous Columban-sponsored plans in many countries, which combine Christian values with practical economics.